If there ever was a real test of how well the controls on the Xperia Play work, then R-Type has to be it. The difficulty of the game is legendary, and although the game has enemies that always follow a certain pattern, you still need lightening reflexes and total confidence in the controls to beat the game. Well, I am happy to report that the Xperia Play passes this test with flying colours, as the controls are spot on and feel just right in the palm of your hand. 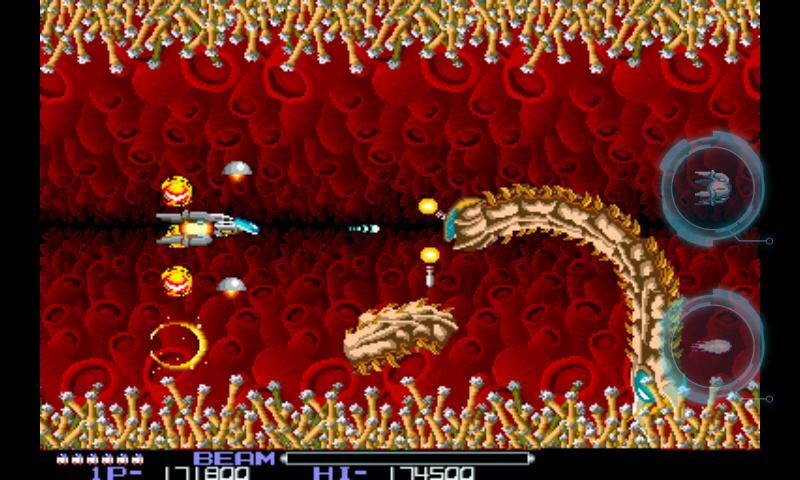 R-Type originally appeared in the arcade courtesy of Irem in 1987, and immediately gained a reputation for being notoriously difficult to beat. Without many hours of practise, finishing the game in the arcade was an almost impossible feat. The story for the game sees you taking on the Bydo Empire, a man-made species that has arrived from the future to destroy humankind. You must hop in your R9 ship and take them out, aided by your Force weapon, a glowing sphere that acts as both a weapon and a shield and the ability to power up your main cannon for a charged shot. The gameplay really revolves around the Force orb, collected from certain downed capsules and can be shot off to fly independently and called back to attach to either the front or back of your craft. Collecting additional power ups results in the Force giving you extra firepower, either bouncing blue lasers, a concentrated wave beam or a ground attack upgrade. There are also small orbs to collect that can protect the top and bottom of your craft and a pair of missiles that home in on enemies, with essential speed ups floating around to help you out. And you will need all of these to get anywhere. If it seems harsh and unfair at points, well that’s because it was designed that way. A game where you have to learn where to be at certain points to avoid trouble, meaning dying and restarting the section until you have either learned how to do it or ran out of lives and had to restart the entire game from scratch. Now all this may put off gamers inexperienced in side scrolling shooters, but it actually provides such a meaty and satisfying gaming experience that it has come to be regarded as one of the greats of the shooting genre. One way that the developer has taken the edge off the difficulty is allowing you to select your starting stage, although be warned as you start without any extra powers. The design of the stages is perhaps one of the best things about the game, with one level where you take on a huge galactic frigate for the entire duration of the stage, standing out even today as being a really cool idea. The music is also great, and is reproduced perfectly for this Xperia Play version. The rest of the game works well on the Play, with the graphics looking pinsharp and as I said, a perfect set of controls. There are a couple of issues, however. There is the occasional slowdown, and while this is not in any way related to the graphics or frame rate, as it seems to be the Android system chugging in the background when it is performing tasks, it is a bit annoying. Secondly, as this was originally a touch screen Android release, the controls overlay on the screen remains. If you select ‘Touch’ as opposed to ‘Arcade’ controls, you only get the virtual shoot buttons instead of the whole shebang clogging up the screen, but it is an issue that I hope the developer will resolve. Just have an option for ‘invisible’ controls and the problem is solved without confusing regular Android users. 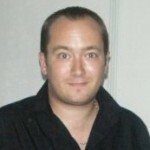 There are two modes of difficulty available, although only one of them will be open until you finish the game, and the developer has wisely added OpenFient integration to the game, so you get a whole load of achievements and online leaderboards included to add some legs to the game. Overall, an excellent conversion of an arcade classic that will have you tearing your hair out with frustration but also appreciating the fine gameplay and brilliant level design in a release that is coherent and satisfying, although a few tweaks are needed. Yup, I’ve got this on my Xperia Play and also on my iPod Touch. Funny thing, it’s not really any easier on the Play than the iPod touch. The Play’s physical buttons seem like a good idea but actually force you to move in only 8 directions which in some ways is less efficient in avoiding bullets than dragging with your finger. On the other hand, its good to see an unobscured screen. Yes, I have this on iOS too, but really have trouble with the whole finger obsuring thing. Games like this that are designed with touch controls in mind from the outset work far better. At least with the Play version you can choose to use touch controls if you like, but its all down to personal preference.